The giraffe (Giraffa) is a genus of African even-toed ungulate mammals, the tallest living terrestrial animals and the largest ruminants. The genus currently consists of one species, Giraffa camelopardalis, the type species. Seven other species are extinct, prehistoric species known from fossils. They can run as fast as 35 miles an hour over short distances, or cruise at 10 mph over longer distances . The giraffe calf can stand up and walk after about an hour and within a week, it starts to sample vegetation. Despite the females’ attempts to stand over their calves during attacks by lions, spotted hyenas, leopards and African wild dogs (4), many calves are killed in their first few months. Giraffes only need 5 to 30 minutes of sleep in a 24-hour period! They often achieve that in quick naps that may last only a minute or two at a time. 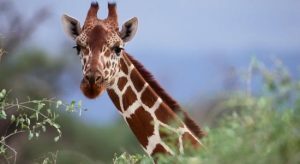 Whilst it was thought that giraffes did not make any sounds, this is now known to be untrue, as giraffes bellow, snort, hiss and make flute-like sounds, as well as low pitch noises beyond the range of human hearing. Thanks for taking your time two read .Please share widely and support us with a donation on our DONATE PAGE.